Booknotes: The Snowden Files by Luke Harding. Just brilliant! 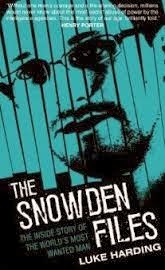 The Snowden Files by Luke Harding. Just brilliant! This just released book by award-winning Guardian journalist Luke Harding is absolutely riveting. It's a very comprehensive telling of the whole Edward Snowden affair from the very beginning to just a few weeks ago. It's as objective as it's possible to be, but it's obviously sympathetic to Snowden's motives, actions and his current plight and vulnerability - stuck in Russia with a very uncertain future. There are many heroes in this fascinating story of our times. Not just Snowden, but the editors and journalists who risked so much, who dared to confront the powerful political and security establishments of the US and Britain and expose their manifest wrongdoing - Alan Rusbridger, editor-in-chief of the Guardian, being a clear case in point. Harding weaves all the elements of this complex tale together seamlessly. In lucid prose he clarifies the technical and legal dimensions and the background political dramas as well.